Ebrahim Khodabandeh was born in Tehran in 1953 and moved to Britain after finishing at Alborz high school in 1971. He did his A-levels at Westoe College in South Shields and did his BSc and then his post graduate diploma for electrical and electronic engineering in the University of Newcastle upon Tyne. Before and after the Islamic Revolution in Iran, he was a member of the Islamic Society in Britain and then he joined the Mojahedin-e Khalq (MEK) in 1980 to oppose the Islamic Republic of Iran. -- He was arrested in Syria in 2003 while carrying a secret task for the MEK, which was transferring about 2 million dollars and some gold, jewelry and documents from Iraq to Paris during the first gulf war. -- He served two months in Syrian detention before he was extradited to Iran and then moved directly to Evin prison. He got 15 years sentence for his activities for a terrorist organization but after 4 and half year was released conditionally on bail. -- Ever since he is studying about mind control destructive cults which he believes the MEK is the most proper example for all cultic behaviors. He has translated and published the following books into Farsi -	"Cults in Our Midst by Margaret Thaler Singer" -	"Releasing the Bonds by Steven Hassan" -- He also had some book written as well as many papers and articles. He has delivered speeches in many universities around Iran and has had many international TV, Radio and press interviews. 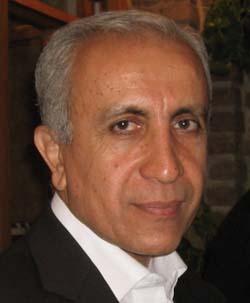 -- Now at the age of 65 he is the CEO of the Nejat Society in Iran which is the voice of the former members and the families of the present members of the MEK. -- A google search could easily lead to his articles and activities in the past 15 years that he is leaving in Iran. - e-mail: . "ceo@nejatngo.org" . "ebrahim.khodabandeh@gmail.com"
Ebrahim Khodabandeh, March 14 2019:… A charity organisation registered in London called the “International Liberty Association” has launched a widespread campaign under the title “Support the Voice of the People” to collect public donations for a television channel belonging to the Mojahedin-e Khalq Organization (aka MEK, MKO, NCR, NLA, Rajavi Cult). London is well known for having been a haven for the money laundry activities of the MEK over many years. When will Maryam Rajavi disappear? Ebrahim Khodabandeh, February 27 2019:… Massoud Rajavi, the leader of the Mojahedin-e Khalq (MEK, MKO, NCR, …) terrorist cult, disappear after the fall of Saddam Hussein in Iraq in 2003. Since then no one knows about his whereabouts; and his wife Maryam practically leads the organization. Ebrahim Khodabandeh, February 20 2019:… I have wondered why the Trump administration has moved the Mojahedin-e Khalq (MEK, MKO, NCR, Rajavi terrorist cult) to a remote and isolated camp in Albania to keep them intact, even though they were meant to be deprogramed and disintegrated there in the first place. I wondered what good they might be for the Trump administration now that they are more than one thousand miles away from Iran’s borders and just inside Europe. Ebrahim Khodabandeh, February 12 2019:… everyone in the west and especially the United States clearly knows how this cult is hated by Iranians. Personalities such as the Secretary of State are well aware that getting near to this notorious cult will not only bring them no credit, but on the contrary would cost their own credibility.The Trump administration might not mind using the MEK covertly for various purposes against the Islamic Republic of Iran, but surely not at the cost of losing its international reputation.